by Chris Russell | Research indicates that the majority of unchurched people would attend a church if they were simply invited. Don’t be bashful. Send a few text messages out to some friends right now to invite them to church! Jesus said in the John 4:35, “Do you not say, ‘There are still four months and then comes the harvest’? Behold, I say to you, lift up your eyes and look at the fields, for they are already white for harvest!” If you are a follower of Christ, I hope you realize how important it is for us to actively be a part of the harvest of souls in our generation. It is absolutely essential that we put our finest efforts into rescuing lives from destruction. But as I mention this subject, I realize many readers begin to tremble with fear. We worry about rejection or not being able to give an answer for those tough questions. Some do not even know where to begin with this mission. 1. Begin by living your life consistently with what God has said in His Word. Many people get tripped up in sharing their faith because they know their lifestyle is not what it needs to be. The solution to this is very simple: turn your entire life over to God completely. Do it now. 2. Begin to publicly identify yourself with Christ through social media. Social media can provide a subtle approach to sharing your faith. Change your “religious views” on your profile to “Christian.” Once or twice a week consider posting a Bible verse on your timeline. Link to your church’s website or to other Christian websites on your timeline. Let friends know you are praying for them when they express a need. 3. Volunteer to serve in a ministry at your church on Sunday mornings. God’s strategic plan for evangelizing this generation is through His Church. When you serve in any of the weekend church ministries, you are becoming a part of the evangelistic machine that changes lives forever. Don’t underestimate the value of changing diapers in the nursery at your church. By serving you are opening up opportunities for people to hear the Word and surrender to Christ. That is a big deal! 4. Keep something on your desk or counter at work that identifies you as a Christian. I had a dear friend (who has now gone on to be with the Lord in Heaven) who kept his Bible on his desk even though he never read it during business hours. And he told me often of how that symbol brought many people to his office asking questions about his faith and asking for prayer for needs in their lives. I would suggest you do something like this to identify yourself in your office as a follower of Christ. This could mean putting a Bible on your desk or something as simple as setting a coffee mug with your church’s logo in some visible part of your office. Better yet, put candy in the mug for coworkers to swipe when they stop in to talk to you! 5. Invite someone to church this Sunday. Research indicates that the majority of unchurched people would attend a church if they were simply invited. Don’t be bashful. Send a few text messages out to some friends right now to invite them to church! Then you can allow the entire church body to be a part of bringing them to Christ! I would suggest that you invite them to church and lunch right afterward. This will turn it into more of a relational event, and you can have a chance to see how they felt about the church service. Some of Jesus’s last words are found in Matthew 28:19-20. In this passage we are commanded to go out and make disciples. And in Acts 1:8, Jesus promises us the dynamic power of the Holy Spirit to help us in that mission. So then, in the power of the Holy Spirit, let’s tell the world of the joy we have in knowing Christ! 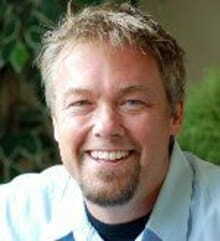 Chris Russell has spent the past 25 years actively involved in ministry through pastoring, church planting, writing, Christian radio, and special speaking around the country and in seven different countries. He is passionate about communicating the truths of God’s Word in a creative, highly-relevant way. by Scott Ventureyra | Due to the collapse of the verification principle, the field of natural science and theology has had a burgeoning discourse with the potential for valuable new discoveries and insights. Despite popular caricatures that the two great fields are at odds with one another, they have had much to say to one another in mutual cooperation throughout history (as demonstrated with Philoponus’s insights and arguments). Popular consciousness in the West has affirmed over and over again, like the beating of a drum, that natural science and theology are in bitter conflict. Recently, evolutionary biologist Jerry Coyne made this claim in a predictable piece, claiming that the two are incompatible and are at war with one another. In recent years, scientific materialists—at full throttle—have pushed forward the notion that natural science is a beacon of light and that the latter—religion—is at best an archaic fairy tale that offers nothing more than false hope, and is at worst a collective madness which stagnates human progress and reason, causing the majority of wars and irreparable psychological damage to human beings. The truth is that explicitly atheistic regimes have been the cause of much more bloodshed than all religious wars combined; only seven percent of all wars have been explicitly religious (i.e., 123 of the 1,763 violent conflicts over 3,500 years). This sort of superficial analysis reminds me of the book, Contact, written by the late astronomer Carl Sagan, which was adapted into a motion picture in 1997. Sagan perpetuated this myth that theology and natural science were engaged in an ongoing struggle. The movie features Ellie Arroway (played by Jodie Foster, who I presume was to some degree the female embodiment of Sagan himself), an astronomer who is obsessed with bringing the SETI (search for extra-terrestrial intelligence) program to its fruition, and her love interest Palmer Joss (played by Matthew McConaughey), a theologian who argues that science and technology have failed to provide any remedy to humanity’s existential angst. In a scene relevant to our discussion, Arroway conjectures that science has demonstrated God’s nonexistence since science operates by proving things and no such proof exists for God. Joss retorts by asking Arroway to prove her love for her deceased father. The point made by Joss is well put, i.e., if he meant that science cannot account for the subjective experience of love. Empirical observation of the causal connections between emotional states and the neurochemical and physiological events within the brain and other parts of the human body would just provide one level of analysis (i.e., a physical explanation) and not the substance or object of one’s love; love involves an act of the will and intellect which is irreducible to the material. Having recently watched Contact again after a number of years, I’ve pondered how I would tackle Arroway’s assertion. To my dismay, many individuals across differing Christian denominations have received impoverished and misguided responses to legitimate questions. The relationship between the sciences and theology is a fundamental obstacle for many inquisitive minds (at least on the surface). On the other hand, it has also distressed me to witness the lackadaisical approach of many believers when it comes to the articulation and understanding of arguments and reasons that support the Christian faith. Indeed, Christianity is undergoing an intellectual crisis; philosophical and theological illiteracy is pervasive in our culture. The average believer would be surprised to learn that there are a number of cogent reasons to accept the existence of God (including the Christian conception of God). It would also astonish lay Christians to learn that science and theology are not in conflict but mutually inform one another. I have sought to demonstrate the plausibility of these two propositions in my book: On the Origin of Consciousness. Instrumental to Philoponus’s approach was a separation between Creator and creation. This belief al lowed him to argue not only that the past was finite, but also that the sun was made of fire, which he acknowledged as a terrestrial substance as opposed to a celestial substance. Thus, Philoponus established that heavenly bodies are not divine and are subject to decomposition, thereby collapsing a central Aristotelian doctrine in the face of a Christian doctrine. Philoponus’s Christian worldview permitted him to also create a coher ent system of thought where he could provide argumentation and evidence to support his belief system—one that was fruitful to scientific discovery. Historians of science have noted that Philoponus’s rigor was beneficial to the future direction of cosmology. Whatever comes to be has a cause of its coming to be. The universe came to be. Therefore, the universe has a cause of its coming to be. Thus, Philoponus’s under standing of reality, which was heavily influenced and guided by his Chris tian faith, brought about several fruits that are relevant to this very day. His theological and philosophical reasoning has been confirmed by modern empirical science, which affirms that the universe is not eternal. This affirmation is made through two lines of reasoning: the standard big bang model which argues for the expansion of the universe and the second law of thermodynamics. Remarkably, both of these can be traced in Philoponus’s thought. Even though the evidence provided by the empirical sciences is typically provisional and can indeed change in the future, we have good rea sons to believe in the beginning of the universe as established by modern scientific data. Philoponus, in the sixth century, exemplifies the strong conso nance between science and theology in the Early Middle Ages. Philoponus’s argument for the finitude of the past has come to be known as The Kalam Cosmological Argument. Today, its foremost defender is philosopher and theologian William Lane Craig. The assumptions regarding the intelligibility and rationality of reality came to shape much of the empiricism in science, as well as the use of math ematics to describe natural processes. Indeed, theological insights and understanding inspired developments in modern scientific thought. This is especially true of great scientific minds such as Isaac Newton, Johannes Kepler, René Descartes, Galileo Galilei, and Nicolas Copernicus, who pos ited that the structure of physical reality was knowable. These explicitly theological ideas—according to which there is intelligibility and comprehen sibility in reality because of God’s role as Creator—inspired scientists to adopt a type of reverse engineering mode of thinking (whereby humans could possibly even modify and perfect creation) in order to understand how things were created (this was precisely the mode of thinking practiced by Isaac Newton). This would help us to perceive how the universe func tioned. The point here is that, from the early modern period until the early twentieth century, scientists were explicitly aided by theological thoughts and notions to discern the existence and operation of nature. The inescap able conclusion here is that modern science was born out of a Christian world view: these theological notions set a framework for scientific research and discovery. Throughout history theological thought and science have gone hand in hand more often than not. Due to the collapse of the verification principle, the field of natural science and theology has had a burgeoning discourse with the potential for valuable new discoveries and insights. Despite popular caricatures that the two great fields are at odds with one another, they have had much to say to one another in mutual cooperation throughout history (as demonstrated with Philoponus’s insights and arguments). Such cooperation continues to this very day. Ever since the 1960s, a number of peer-reviewed journals devoted to this dialogue have sprung into existence. They include CTNS: Theology and Science Journal, The European Journal of Science and Theology, Zygon: Journal of Science and Religion, and the latest addition: Philosophy, Theology and the Sciences. Indeed, the field is growing and gaining interest from scholars of a variety of disciplines. There have also been a series of typologies outlining the relationship between science and theology offered by scientists and theologians such as Ian Barbour, Ted Peters, Willem Drees, John Haught, and Robert John Russell. Of these, the most promising method is Russell’s Creative Mutual Interaction (CMI). What is novel and promising about this method is that not only do scientific research programs influence theological research programs, but theological research programs, in turn, influence scientific research programs. Russell uses a theology of nature for his CMI. In my book, I have transposed this and utilized instead a natural theology for my CMI method. Natural theology functions as a rational endeavor to adduce God’s existence and purpose in nature through understanding the natural world (through using philosophical tools and the best scientific evidence available, sans the aid of biblical revelation). By contrast, a theology of nature like Russell’s begins through the Christian tradition via religious experience, and historical and biblical revelation. Furthermore, a theology of nature suggests that certain Christian doctrines may require revision in light of modern scientific findings. Both approaches have their fruits and purposes. If the real is completely intelligible, then complete intelligibility exists. If complete intelligibility exists, the idea of being exists. If the idea of being exists, then God exists. Therefore, the real is completely intelligible, God exists. It is worth pointing out that finite intelligibility is grounded upon complete intelligibility. The fact that we are able to formulate general laws of science, use mathematics and logic, possess the ability to communicate, and discern truth in its different manifestations is a reflection of an unbounded intelligibility—the sort of thing we should expect if there is any correspondence between reality and our minds. Philosopher and theologian Jay Richards and astrophysicist Guillermo Gonzalez have developed an argument based in science which is highly relevant to Lonergan’s argument for God and intelligibility. It provides the scientific basis for Lonergan’s onto-epistemic argument. In their book The Privileged Planet, Gonzalez and Richards lay out a scientific argument with deep metaphysical implications. They provide a host of different lines of evidence to suggest that the earth occupies a special place in the cosmos. Their argument goes against the popular notion held by many scientists and popularized by Carl Sagan. Sagan argued that the Earth had no special or privileged place in the cosmos and that it was merely an insignificant cosmic accident, which he dubbed a “pale blue dot.” His book and the saying were inspired by a famous photograph taken of Earth on February 14, 1990, by the Voyager 1 space probe, which depicts Earth as a tiny speck in the vastness of space and bands of sunlight. This is strongly connected to the misnamed Copernican Principle, which Gon zalez and Richards refute as well. Gonzalez and Richards argue that there is a deep correlation between habitability and scientific observability. The fact that we exist on a particularly special type of planet (i.e., Earth), is also related to the fact that we are in such a place, with a purpose, to observe the universe and discover, measure, and understand much of the cosmos. They provide examples of the correlation between habitability and measurability. Richards and Gonzalez illustrate, in a scientific manner, the very intelligibility which Lonergan describes as being intrinsic to a reality grounded upon the ultimate source of all intelligibility. Thus, we have examined various lines of reasoning which demonstrate that neither science nor reason are in conflict with theology. God’s existence is supported by logic and scientific argumentation. In fact, the real culprit for the dissonance between science and religion is found in the atheological worldview of metaphysical naturalism; metaphysical naturalism is the belief that nature is all there is and that no supernatural beings such as God exist. It is a philosophical prejudice that has little grounding in actual science and is increasingly challenged on both philosophical and scientific grounds. A believer in a Creator God should not find this surprising but it is comforting to know that contemporary scientists are increasingly recognizing the debt modern science owes to theology. Scott Ventureyra earned a doctorate in theology from Dominican University College in Ottawa, Canada in 2017. He has published in academic journals such as Science et Esprit, The American Journal of Biblical Theology, Studies in Religion and Maritain Studies (the journal of the Canadian Jacques Maritain Association). He has also written for magazines such as Crisis and Convivium and newspapers such as The National Post, City Light News, The Ottawa Citizen and The Times Colonist. He is the author of On the Origin of Consciousness: An Exploration through the Lens of the Christian Conception of God and Creationpublished by Wipf and Stock (November 2018). His website is: www.scottventureyra.com. by Paul Kengor | Charles Murr says that Cardinal Gagnon explained to him hundreds of times that the enemies of the Church were not out to totally destroy the Church, because the membership and organization of the Church were far too precious; rather, they wanted to control the Church according to their own vision and scheme (getty images). 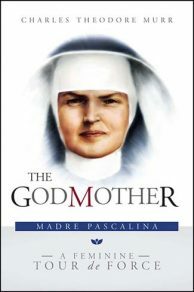 For keen insight into some of the malevolent forces at work in the Church right now, an unexpected source is a fascinating book by Father Charles Theodore Murr, titled, The Godmother: Madre Pascalina. Published in May 2017, for the centenary of Fatima, it is one of the most interesting yet underreported Catholic books of recent years. The impetus was Fr. Murr’s utterly unique relationship with the figure closest to Pope Pius XII: Sister Josephine Lehnert (1894-1983). Mother Pascalina was so close to, so trusted by, and so influential to Pope Pius XII, that wise-guys around the Vatican alternately called her La Popessa and Virgo Potens (Powerful Virgin). Charles Murr was a young American seminarian in Rome in the 1970s. He had a lifelong special devotion to Pius XII. He knew about the iconic Madre Pascalina. Over dinner one day at Il Scarpone restaurant with his colorful friend Monsignor Mario Marini—a classic boisterous Italian who held an important job at the Vatican Secretariat of State—Charlie learned that the old nun was still alive. “She’s alive?” he asked with astonishment. As a favor to Charlie, Marini made some moves within the Curia and secured an address and phone number. Charlie picked up a phone and took a chance. The rest is history—this history in this delightful book. Charlie and Madre Pascalina first met in 1973, quickly becoming close friends. She would become his literal godmother at his ordination, the date of which she suggested: May 13, 1977, Feast Day of Our Lady of Fatima. They met frequently until Charlie was sent to Mexico in 1979. He would see her once more in 1983, only weeks before her death. The things she told him constitute a remarkable heretofore unpublished account of the Church in the twentieth century, from the historical to the theological to the ideological—and perhaps even to the level of diabolical, in some cases. At long last, Charles Murr has shared them. The book’s accounts of Pope Pius XII, from the person who knew him best, are striking enough. So are the insights regarding nearly every twentieth-century pope and even would-be popes such as the excellent Cardinal Giuseppe Siri and Cardinal Giuseppe Benelli, who both barely missed the papacy in the late 1970s. There are compelling stories I had never heard before about Padre Pio, about China’s Cardinal Thomas Tien Ken-Sin, and about Cardinal Edouard Gagnon, a dedicated French-Canadian—and future prefect for the Pontifical Commission for the Family—who was greatly frustrated by the failures of Paul VI to react to what Gagnon had documented (at Paul VI’s request) regarding wholesale corruption of the Curia. There are also intriguing inside tales of the rivalry between Fulton Sheen and Cardinal Francis Spellman, and of the perfectly preserved corpse of Pius IX that Madre Pascalina was there to inspect first, many decades after the pontiff passed. But getting closer to some of the seeds that were laid for the current chaos in the Church, Charles Murr takes a deep dig into the circumstances around Angelo Giuseppe Roncalli and Giovanni Battista Montini, who assumed the papacy as, respectively, John XXIII and Paul VI. The Madre wasn’t a big fan of either, particularly John XXIII, whom she dismissed as un buffone (“a clown”). It wasn’t always the popes themselves that Pascalina held responsible for certain troubles—it was often the men they surrounded themselves with and naively listened to and were often misled by. Take Pope Paul VI, whose right-hand man in dealing with murderous communists was Cardinal Agostino Casaroli, whose counsel on handling the Soviets and Communist Bloc despots was often downright lousy and counterproductive. Of course, Casaroli and Paul VI and John XXIII were certainly not Marxists, but they thought they could deal with Marxists, that they could negotiate with them, that they could even accommodate them. Like Pope Francis, these two popes were heavily influenced by key advisers (whom they chose themselves) who were leftist-progressives and who gave them bad advice in dealing with enemies of the Church, sometimes internal enemies. As to Paul VI, we know about the tragic case of Cardinal Mindszenty as an indicator of his embarrassments in trying to satisfy Moscow. Roncalli likewise had his share. For Vatican II, according to Madre Pascalina, the one thing that Pope Pius XII had wanted ahead of time—and yes, she says it was Pius XII who had the initial idea for a council—was an unequivocal condemnation of communism. And yet, that was “the one thing that Roncalli absolutely refused to do.” (This adds new insight to my piece last year on Vatican II’s unpublished condemnations of communism.) This refusal, revealed Madre Pascalina to Charlie, was done as a promise to the Soviet government and the Kremlin-controlled Russian Orthodox Church in the name of ecumenism, and it presaged later such moves by Paul VI. I personally believe this is very fitting to our situation with our pope today, who I contend is far more naïve than nefarious, duped than duplicitous—but has nonetheless created his own terrible mess by surrounding himself with progressive Church officials who have served him dreadfully. Indeed, there is so much in this book that is important if not profound to current realities as we watch the crises in the Church unfold, from my home dioceses in Western Pennsylvania to Cardinal McCarrick to the unacceptable happenings at the Vatican under the nose of Pope Francis. Charles Murr calls attention to some dubious characters, if not outright evildoers, in the latter twentieth-century Church. And that’s where Murr’s eyewitness testimony, based on what he saw in Rome in the 1970s and what Madre Pascalina conveyed to him, is so rich and relevant. What we’re seeing right now are the bitter fruits of the rotten seeds sown by a network of progressives, liberals, and the very “modernist” heresy that Pope Pius X warned about in 1907. Baggio, Charles Murr contends, was not merely a progressive/modernist but a Freemason. He died in March 1993, living the last decade of his life with (in Murr’s words) “Pope John Paul II watching his every move.” The Polish pontiff put the former “Appointer of Bishops” in charge of printing and distributing Vatican City postage stamps. It was a demotion and slap-down, but the damage was done. The seeds for the bitter harvest were in place. I asked Murr last week whether he saw the hand of the likes of Baggio in the current crisis. “Unquestionably,” he responded. Murr stressed that Baggio dedicated “much time and very particular attention” to potential “archbishop material,” since it was from such persons that cardinals were created. Baggio spent summer vacations visiting out of the way places in the world; places where he had named the archbishops. He would be their house guest, and when they traveled to Rome on Church business, Baggio made sure they saw him in his prefect’s office in the Congregation for Bishops. Murr said flatly that Baggio deliberated and exclusively created liberal bishops, and that any orthodox bishop or archbishop who managed to be named during those years occurred only due to dramatic efforts by orthodox members of the Roman Curia to convince Pope John Paul II to override Baggio. These exceptions infuriated Baggio. Pope Paul VI failed to deal with Baggio. When Charlie’s good friend, Edouard Gagnon, fulfilled Paul VI’s request to provide an in-depth report on what that “smoke of Satan” inside the Church looked like, Gagnon was practically despondent when the old, ailing Papa Montini made clear that he would choose to punt—that is, to pass along Gagnon’s investigation to the next pope. The next pope would be John Paul I, who attempted to discipline Sebastiano Baggio. How did that go? That night was not a good one. In one of the most dramatic sections of his book, Fr. Charles Murr writes this of John Paul I and Cardinal Baggio: “The last person to see him [John Paul I] alive,” Gagnon told Murr, “was none other than Sebastiano Baggio. He [Baggio] entered the papal apartments after eight o’clock that night; the last person to speak, to scream, at the pope.” Following Cardinal Benelli’s wise counsel, Pope John Paul I had just removed Baggio from the Congregation for Bishops. The new pope died right after that. Make of that what you will. I can neither add to that nor confirm. Of course, Cardinal Baggio was not the only person causing mischief and mayhem. It was a team effort by multiple players of bad faith. Still another Church official who seems to have caused serious problems was Cardinal Annibale Bugnini, through his appalling “liturgy reforms.” Murr likewise casts a light on Bugnini. In all, such were the kind of men in the Church who appointed the kind of men in the Church who have disappointed us so often. Alas, here’s an interesting distinction underscored by Murr: He says that Cardinal Gagnon explained to him hundreds of times that the enemies of the Church were not out to totally destroy the Church, because the membership and organization of the Church were far too precious; rather, they wanted to control the Church according to their own vision and scheme. They wanted to remold and use it. They wanted it to be their Church remade in their image. Needless to say, this book (and this article) is not a comprehensive accounting of all that has hurt the Roman Catholic Church over recent decades. There were plenty of insidious influences from all sorts of destructive forces. Nonetheless, we should not look past these progressive modernists in the Church. Madre Pascalina saw them coming, and the chaos that would ensue, and Fr. Charles Murr offers this crucial timely reminder of who they were—and are still. by R. Jared Staudt | Recognizing the never-ending crisis in the Church does not distract from the need for real reform and for holding people accountable. But it does point us to the heart of Jesus’s call to faith and trust in his providence (image: Shutterstock). A crisis that strikes so centrally at the integrity of the Church necessitates a response from each one us. There must be general reform in the Church, but I’d like to explore how each one of us can respond to the Church’s crisis with a commitment to stronger faith and personal reform. In focusing on this personal response, I am by no means equating personal sin with the deep corruption we are discovering, nor seeking to take focus away from needed calls for practical change. The crisis to which I am responding, however, goes beyond the recent scandals to the underlying crisis of faith that has weakened the Church as a whole. Although the main thrust of this reflection predated the recent scandals, and comes from a talk I gave in the spring, I offer it now in hopes that it may help focus us on our response to them. We must decide how we will respond to the storm. Jesus looks at each one of us as we are rocked by the waves. There is no one to grab onto, the wind is whipping up, and we are beginning to sink with discouragement. Do we keep our eyes on Jesus or do we focus on the storm surrounding us? Right now, many of us are drowning in the confusion and scandal caused by leaders of the Church. Does Jesus need to tell us, like Peter: “You of little faith, why so afraid”? The devil uses real problems in the Church to tempt us to sin against faith. If we take our eyes off of the Lord, we could be tempted to think that our faith is based upon the human dimension of the Church. There are so many reasons to be discouraged, but we are called to a supernatural response to God’s plan. There can be no doubt that the Church is facing a general crisis. It’s not hard to find statistics of the precipitous decline in Church attendance as well as the reception of the sacraments, and there’s no need to repeat them here. Even many Catholics who come to Church do not fully profess faith in the Church’s teaching and may receive the Eucharist unprepared and in a state of sin. We now see that our leadership has been compromised in fundamental ways. And yet, the Church always faces some form of serious crisis. It is built into the nature of the Church as a mystical association of believers, to receive God’s sanctifying grace while remaining weak and sinful human beings. The Church contains both sinners who are experiencing lifelong conversion and hypocrites who reject God’s grace but remain within the Church and even hold positions of authority. Recognizing the never-ending crisis in the Church does not distract from the need for real reform and for holding people accountable. But it does point us to the heart of Jesus’s call to faith and trust in his providence. God wills the Church to be weak and to suffer. That may sound nice in theory, but the self-inflicted nature of this suffering is particularly hard to bear. Pope Benedict XVI has often pointed this out: “The suffering of the church comes from inside the church, from sin that exists inside the church.” It is tempting to evaluate this statement only from the viewpoint of the clergy, particularly in light of grievous scandals, but the laity, too, must recognize that we are part of the problem. We are also a large part of the solution, if we cooperate with God’s grace. Looking to the saints, the great reformers, we must dedicate ourselves to reform, embracing the Lord’s call to conversion and holiness so that we can play our own part in the Church’s mission with renewed faith and strength. There are three major fronts to the crisis facing the Church: doctrine, corruption, and secularization. We could describe these points further as not teaching and adhering fully to divine revelation and dogma; abandoning the call to holiness and the moral demands of God’s commandments; and a breakdown of Catholic culture and the Christian way of life. A fundamental crisis of faith underlies all three points: namely, not adhering to the faith and not living it out personally and socially. It is true that the Church constantly faces challenges to faith and the moral life, but secularization offers a new and unique challenge. Never before have Christians lived within a secular culture, which pushes God to the sidelines of society, living life as if he did not exist. This secularization has brought unprecedented challenges to the Church and society, as we have called even the fundamental realities of life into question: marriage, the nature of man and woman, and the dignity of human life itself. Secularization is a challenge to the Church because it influences her members in fundamental ways that impede the life of faith, sapping the dynamism of their spiritual lives. Both the clergy and laity have not been true to the faith. Clergy have not insisted on its integrity and have not taught it fully and faithfully. The laity have rejected large portions of it and have fallen into relativism. Both the clergy and laity have not lived the faith and kept true to the moral law. Many members of the clergy have not been faithful to demands of celibacy or have fallen into spiritual mediocrity. A large percentage of the laity contracepts, has gotten divorced, and has abandoned the practice of the faith. Is there a connection between the overarching failings of the clergy and the laity? Absolutely, as neither has kept the other accountable, in large part due to their own failings. The Church’s crisis of faith creates scandal particularly by fostering discouragement. As it appears that the Church lacks faith and holiness, many begin to question if they are real and possible. To fight against discouragement, it is important to reflect on why the Lord allows weakness and sin to remain within his Church. Paul described this by saying that “we have this treasure in earthen vessels, to show that the transcendent power belongs to God and not to us” (2 Cor. 4:7). God wants the Church to be weak so that he can tell us with Paul: “My grace is sufficient for you, for my power is made perfect in weakness” (2 Cor. 12:9). The Lord desires to work through the ministry of sinners so that we realize that he alone is the source of grace and truth. The perpetual crisis of the Church continues when her members become self-referential, pointing to themselves above Christ and using the Church for self-serving ends. Fr. Thomas Weinandy pointed to this reality at the heart of the Church’s crisis: “I have often asked myself: ‘Why has Jesus let all of this happen?’ The only answer that comes to mind is that Jesus wants to manifest just how weak is the faith of many within the Church, even among too many of her bishops.” Ironically then, the Lord may allow the crisis we face to strengthen our faith in him. He helps us to realize time and time again that we can do nothing without him. The constant need for conversion entails turning from ourselves to Christ for our salvation. The woundedness of the Church continues the scandal of the Cross. Just as the Jews and Greeks objected to salvation through the Resurrection of one Jewish man, acknowledged to be the Son of God, so the world understandably bulks at this salvation coming to it through the ministry of sinful Christians. The Church must guard against complacency to the sin of her members, however. Otherwise, Catholics, whether the clergy or laity, can become like the unfaithful servant in Christ’s parable, who says: “‘My master is delayed in coming,’ and begins to beat the menservants and the maidservants, and to eat and drink and get drunk, the master of that servant will come on a day when he does not expect him and at an hour he does not know, and will punish him, and put him with the unfaithful” (Luke 12:45). We must constantly realize that we are sinners representing and serving God, who must seek ever-greater conformity to the Master. Otherwise, he will disown and punish us. Lack of faith and the betrayal of sin have been a constant problem throughout history. Tracing the weakness of the Church—of God’s people—is not just a matter of history, but also a matter of listening to divine revelation. We can see how even our father in faith, Abraham, sought to force God’s promise by taking a concubine, how Israel rejected God in the desert after seeing his wonders, and how idolatry remained a constant struggle in the promised land. Most poignantly, we can see how the king after God’s own heart, David, responded to God’s promise that his throne would endure forever (2 Sam. 7), by committing the sins of adultery and murder (2 Sam. 11). Furthermore, his son Solomon, who received extraordinary blessings from God, fell into idolatry, only a minority of David’s descendants were faithful, and the promised line of kings ended in exile. The Apostles weren’t much different. Jesus made another extraordinary promise to Peter only to call him “satan” five verses later for seeking to impede God’s plan (Matt. 16:18, 23). The same rock denies Jesus three times as all the apostles disperse, and one of them betrays his own master. Later, Paul had to correct Peter over his hypocrisy toward the Gentiles. Nothing could show us more directly how God works through weakness than how he established his Church upon the weakness of our humanity to manifest the power of his divinity. God gave us a clear sign to expect human weakness in our leaders, even as he showed us the transformation he could enact when the Holy Spirit acts through this weakness, such as at Pentecost. The Church has faced many serious crises in history: severe persecution, which included not only the faithfulness of the martyrs but also many who betrayed the faith; heresies which overwhelmed a great number of bishops, especially Arianism; the destruction of images of Christ through the East in the iconoclast controversies; the external threat of Islam which overwhelmed the Christian heartland; the ignorance of priests and the corruption of the hierarchy in the Middle Ages; schisms in both East and West; the Protestant heresy which split Christendom in half; modern revolutions which nearly extinguished the priesthood and sacraments in entire nations; confusion in the Church’s liturgy and doctrine; and the secularism which has overwhelmed Western Civilization. And what of the successors of St. Peter? We see both the power of God’s promise to make Peter the rock for the preservation of faith and the weakness and corruption of many popes who needed to be rebuked as satan for impeding the will of God. The laity has intervened at crucial moments in favor of reform. Even the monastic movement began largely as a lay response of personal conversion and reform, gaining popularity once the threat of Roman persecution waned and the Church entered mainstream society. The first ecumenical councils arose at the initiative of the Roman emperors. Similarly, early Germanic emperors intervened to depose some of the most corrupt popes in history in the tenth century. Nonetheless, the intervention of secular rulers would plague the Church as well, with Byzantine emperors seeking to impose heresy and Holy Roman Emperors and later monarchs attempting to control bishops (and many times succeeding). Every crisis, however, brings forth a new champion of the faith, such as Athanasius who stood against the world in the Arian crisis. Merely human responses will not succeed and will introduce new problems. We cannot focus only on exterior solutions and policies without insisting on interior conversion. We can remove corrupt leaders, but who will replace them? The saints model the authentic reform that begins with oneself. St. Charles Borromeo led the true Reformation by modeling reform himself, which then inspired institutional reform. Holiness—expressed in prayer, penance, and virtue—must be the center of any true reform. Giving up by abandoning the Church. Complacency in simply accepting things as they are for better or worse. Corruption in resisting reform and remaining in sinful practices. Reform by seeking holiness above all else for oneself and others. Option four will require us to ask with Chesterton, “What’s wrong with the world?” including the Church, and also to answer with him: “me.” This answer does not deny the faults and corruption of others, or turn a blind eye to the need for accountability, but recognizes that my sins are part of the problem. In fact, they are central for each of us, because they are the part of the problem for which we bear direct responsibility. For reform to succeed, stronger faith, repentance, and the will to change must flow from many Catholics. Only in following my “yes” to personal reform, can I be a part of the broader solution by allowing Christ to act through me. Trials in the Church invite us to strengthen our faith. They invite us to examine the source of our faith. Why do we believe? Because we grew up Catholic, have been inspired by a particular priest or fellow Catholic, have enjoyed coming to Church (as unlikely as that might be), or have been encouraged or comforted by being Catholic? These things may have a role to play, but our faith must be rooted more deeply. Do we believe that Jesus is the Christ who has come into the world for our salvation? We must remind ourselves that we believe in God, not in human beings. In response to the crisis of the Church, I affirm my faith in God and the trust I have in him, recognizing that he is the source of my confidence, not myself or any other human being. I believe that Jesus is the Son of God become man to reveal the truth of God and to lead us to salvation. I believe that Jesus founded the Church to communicate his truth and transmit his grace in the sacraments. I believe that Jesus chose to work through flawed and sinful human beings, including his own disciples, despite the scandal that this involves. I believe that Jesus will preserve the Church from definitively teaching errors in faith and morals, even though Christians will fail in their own roles to teach and witness the faith. I believe that God’s providence will continue to guide the Church through history to the second coming, that the gates of Hell shall not prevail against the Church, and that God will use our weakness for his greater glory. I believe that God is calling me to holiness despite all the obstacles in my own life, the Church, and society. I know that I am a sinner and that the Lord calls me now to a deeper conversion and relationship with him. As we renew our faith, we must also reform our lives so that they embody what we believe. This will require an increase in humility, recognizing our own weakness and absolute dependence on God. We must also increase our life of prayer, seeking the one thing necessary and recognizing that all good comes from prayer. In addition, we must practice mortification and penance to reach true conversion of life and to make reparation for our sins and those of the Church. We will have to hold fast to the truth in love and patience, witnessing to and serving others. Ultimately, we must form a Christian culture (or way of life) in our family, work, and in all that we do, recreating the necessary soil for renewal. This desire was great and continuous, but grew much more, when the First Truth showed her the neediness of the world, and in what a tempest of offense against God it lay. And she had understood this the better from a letter, which she had received from the spiritual Father of her soul, in which he explained to her the penalties and intolerable dolor caused by offenses against God, and the loss of souls, and the persecutions of Holy Church. All this lighted the fire of her holy desire with grief for the offenses, and with the joy of the lively hope, with which she waited for God to provide against such great evils. And, since the soul seems, in such communion, sweetly to bind herself fast within herself and with God, and knows better his truth, inasmuch as the soul is then in God, and God in the soul, as the fish is in the sea, and the sea in the fish. R. Jared Staudt works in the Office of Evangelization and Family Life Ministries of the Archdiocese of Denver. He earned his BA and MA in Catholic Studies at the University of St. Thomas in St. Paul, MN and his PhD in Systematic Theology from Ave Maria University in Florida. Staudt served previously as a director of religious education in two parishes, taught at the Augustine Institute and the University of Mary, and served as co-editor of the theological journal Nova et Vetera. He and his wife Anne have six children and he is a Benedictine oblate. Becky Harling | The truth about God is that nothing can separate us from His love. Even if some of our worst fears happen, God’s love does not change (image: James Marler). Recently, I was reading the story found in Matthew’s Gospel where the disciples leave Jesus to go ahead of Him across the Sea of Galilee (Matt. 14:22-33). The disciples head out across the dark lake while Jesus retreats for some time alone in prayer with His Father. Later that night, when the boat was a considerable distance from the shore and struggling because the waves had kicked up, Jesus headed out to meet them, walking on the water. When the disciples saw a figure coming across the water, their imaginations went wild, and they freaked out thinking Jesus was a ghost! Jesus immediately said to them, “Take courage! It is I” (Matt. 14:27b, NIV). At this moment Peter a bit unsure said, “Lord, if it’s you… tell me to come to you on the water” (Matt. 14:28). Jesus immediately invites him, saying, “Come” (Matt. 14:29). You know the rest of the story. 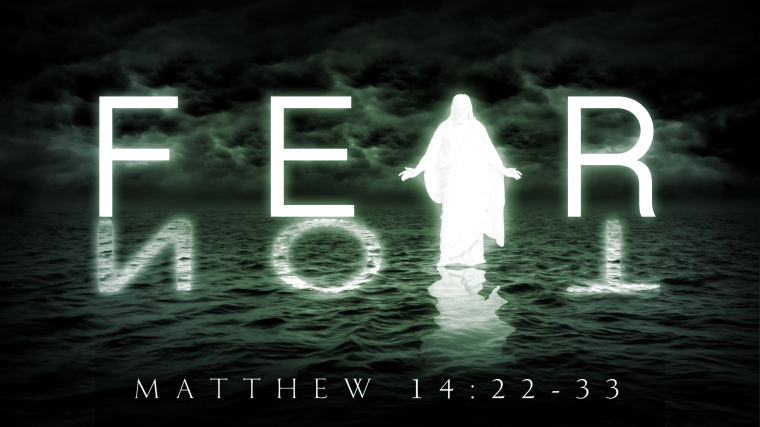 As I’ve been reading this story and mulling it over in my mind, it dawned on me: At times, Jesus provokes our fears. In this particular story, it seems as though He’s baiting the disciples’ fears! Why? I believe it is because He wanted to give them the opportunity to move past their fears and come to a greater understanding that He was the Son of God! In your life and mine, we are plagued with lots of fears. Our imaginations at times get the best of us. We fear financial setbacks, insignificance, loss of control, sickness and a host of other things. Here’s the thing: Jesus wants to heal our fears. Often the best way to do that is for Him to provoke our fears so that we have to face the truth about our fears and the truth about who Jesus is in those fearful situations. What is the truth about my fear in this situation? Talking to yourself is actually a great practice because it can help you manage your emotions. Next time you feel afraid, go to your fear. Don’t run from your fear—denial has never helped anyone! Instead, ask yourself, “What’s the worst that can happen?” Then don’t stop there, but go on to ask, “Is my imagination getting the best of me?” The disciples in the boat let their imaginations run wild thinking, “It’s a ghost!” Don’t make the same mistake. Often our perceptions of reality are quite different from what reality actually is. For example, suppose at work you are not given the promotion you feel you deserve. As a result, you begin to imagine, “I’m just irrelevant in this company. No one needs me anymore. Blah, blah, blah.” The truth might be that God is protecting you from something you can’t see. The truth might be that God is about to open an exciting door for you that you wouldn’t be able to take if the promotion came through. So instead of imagining the worst, remind yourself that God has your best interests in mind. Is there a step of faith I need to take? Often, fear is what holds us back from stepping into all that God is calling us to do. The way to move past fear is to accept Jesus’ invitation to come and take the step out of safety to join Him in the adventure to which He’s calling. If Peter hadn’t taken the risk to get out of the boat, he would never have walked on water.